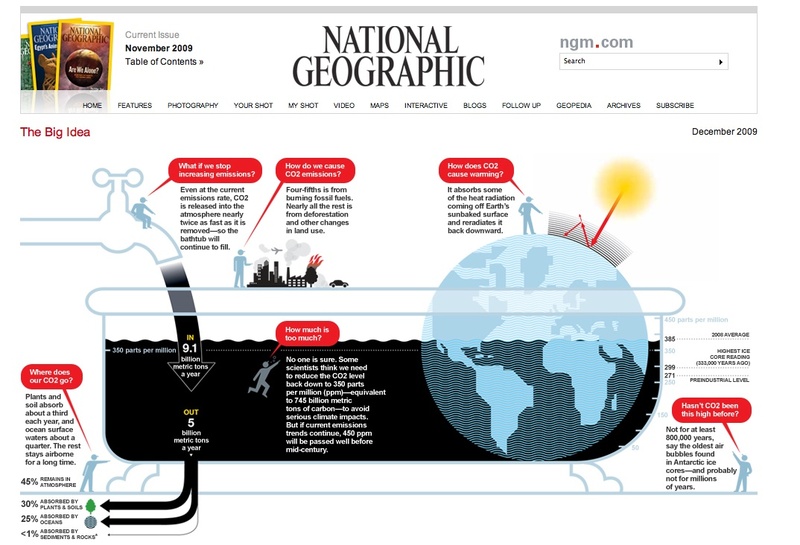 The December issue of National Geographic Magazine covered the “Carbon Bathtub” as framed and explained by Climate Interactive partner Dr. John Sterman of the Sloan School of Management at MIT. Check it out online. This beautiful and information-filled graphic illustrates a powerful way to think about the dynamics of the climate system: as behaving a lot like a simple bathtub. Dr. Sterman has been developing this idea with various colleagues (many of them part of the Climate Interactive greater team) over the past years, going back to two seminal papers with Dr. Linda Booth Sweeney on studies at MIT: “Bathtub Dynamics” and “Understanding Public Complacency About Climate Change.” These papers culminated in an important Policy Forum piece in the journal, Science. For a lighter read, explore the popular version in Rotman Magazine. And experiment with the Bathtub Simulator we built and one that Dr. Sterman built. Indeed, it was the clarity and explanatory power of the Carbon Bathtub that helped lead several of us here at Sustainability Institute to focus on applying systems thinking and system dynamics modeling to climate issues six or so years ago. Great work John and great work National Geographic designers and illustrators. Beautiful and important work! Looks like we are buying the December issue! Great job everyone! From Darcy Winslow and Jenna Forstrom at DSW Collective! I emailed John & told him that this was really awesome & important both for climate change but also for Systems Dynamics. Congratulations! Great visual organizer for my high school students. Simple and well organized. Thanks! What an interesting concept the carbon bathtub is. I love models that help simplify concepts that way. As I was reading the post I was thinking “But the real problem is people just don’t seem to care.” And then you mentioned the study on complacency right with it. What great work they do at MIT.